The Ecoliv Buildings Eco-Balanced Display Home by Beaumont Concepts Building Design features a finely tuned yet modest design. 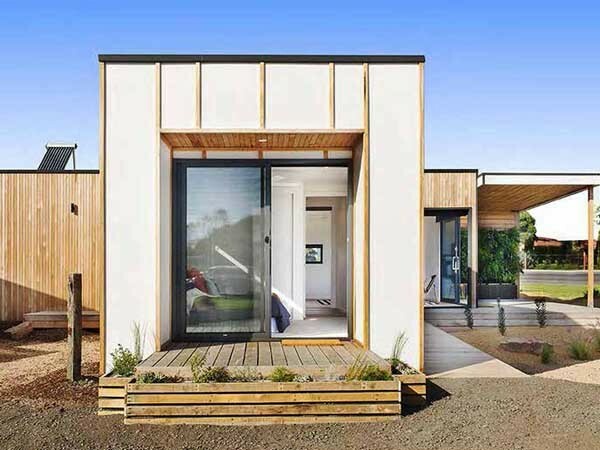 The Eco Balanced 1 pushes the boundaries of standard domestic construction to achieve the cost, time and resource efficiencies that appeal to the sustainable prefabricated housing market. With an 8 star energy rating, this home displays what can be achieved when building a cost-effective and environment-friendly home. The display home combines a contemporary form and streamlined layout with a passive solar design and systems integration to ensure thermal comfort all year round. The home’s interior focusses on using affordable, sustainably sourced and recyclable finishes with low toxicity to preserve the internal air quality. The passive solar design achieves an 8 star thermal performance rating using solar hot water and electricity, high performing Earthwool insulation, energy efficient lighting and appliances, 3000-litre water tank configurations, high WELS rated plumbing, grey water system, Green Switch, low VOC paints and no MDF joinery and fixtures. The builders chose plantation timber for the subfloor and framing because it uses less energy to produce than a traditional concrete subfloor and can reduce environmental impact significantly. The naturally lightweight construction methods of Eco Balanced 1 utilise plantation timber frames and trusses and high levels of Earthwool insulation to respond to the temperate southerly climate. Earthwool insulation made using ECOSE Technology is one of the most sustainable glasswool products available in the market. ECOSE Technology is a revolutionary formaldehyde-free binder based on rapidly renewable materials instead of petro-based chemicals, and contains no added formaldehyde, phenols or acrylics. Ashley Beaumont from Beaumont Concepts Building Design explained that a key objective was to ensure all products used in the home had low embodied energy and Earthwool met the requirement of the Eco Balanced 1 home. Earthwool insulation was installed in the roof, wall and floor of Eco Balanced 1, not only to provide thermal and acoustic insulation but also for its Eurofins Gold certification for indoor air quality. The use of Earthwool insulation also allowed Ecoliv Buildings to build a home that didn’t rely on thermal mass and high embodied energy products to achieve an 8 star thermal rating.